Hospice of Santa Barbara (HSB) will honor local heroes at its 6th annual Heroes of Hospice Jewels by the Sea luncheon 11 a.m.-1:30 p.m. Sept. 12, at the Four Seasons Biltmore, Coral Casino in Santa Barbara. Each year, HSB recognizes the outstanding organizations and individuals who play a key role in service to those in our community and/or support the organization’s mission of providing care to anyone experiencing the impact of serious illness or grieving the death of a loved one. This year, HSB will honor the Cottage Children’s Medical Center Pediatric Hematology/Oncology and Teddy Bear Cancer Foundation; Montecito Bank & Trust; Organic Soup Kitchen; and Marybeth Carty, the executive director of the Natalie Orfalea Foundation. “Our honorees this year demonstrate the excellence and heart of our community,” said David Selberg, CEO of Hospice of Santa Barbara. 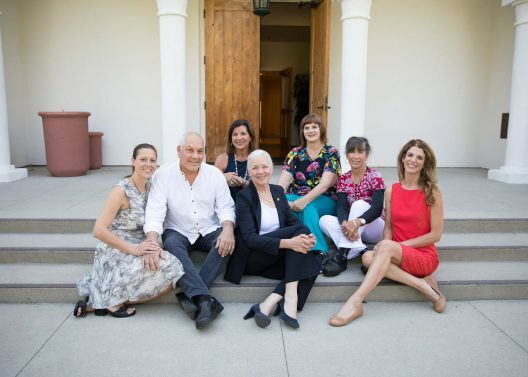 “These heroes are part of the fabric of the work we do at Hospice of Santa Barbara as well as the contributions they provide generally. We are honored and pleased to recognize them,” he said. As part of the Heroes of Hospice lunch reception and ceremony, Hospice of Santa Barbara will also be showing off other local gems including pieces of new and antique hand-picked jewelry that will be the highlight of the silent auction collection. At Cottage Children’s Medical Center Pediatric Hematology/Oncology, child patients receive personalized, comprehensive care from medical professionals. The Cancer Care and Hematology Clinic at Cottage Health is recognized as a Special Care Center (SCC) by the state of California, meaning that children with acute and chronic conditions can receive comprehensive care covered by California’s Children’s Services. Cottage Health supports families that apply to financial assistance programs, which are available through local and national cancer foundations such as the Teddy Bear Cancer Foundation. Teddy Bear Cancer Foundation (TCBF) provides financial and emotional support to families of children with cancer living in Santa Barbara, Ventura, and San Luis Obispo counties. Since 2002, TBCF has worked to provide families with financial assistance for critical needs, such as rent assistance and family support groups. Legacy Award — Montecito Bank & Trust opened its first branch in 1975 and grew to become the largest locally owned community bank along the Central Coast. Montecito Bank & Trust’s commitment to serve its community members, as demonstrated by the 5,200-plus hours its employees spend volunteering for local organizations every year. Since 2013, the bank’s community dividends program has donated $1 million annually to organizations throughout Ventura and Santa Barbara counties. Organic Soup Kitchen has delivered high-quality, nutritious foods to residents facing dire health and financial challenges since 2009. The organization serves low-income cancer patients while working with local farmers to reduce food waste and carbon footprint. Organic Soup Kitchen also assists veterans, low-income seniors, and the Women’s Free Homeless Clinic. Carty has more than 15 years’ experience working in community partnerships, corporate philanthropy, and social responsibility and has spent the last 25 years in board leadership and service positions. Carty is the executive director of the Natalia Orfalea Foundation, a local organization focused on early childhood education, youth development, school food programs, and disaster readiness. Carty also was instrumental in the establishment of HSB’s Compassionate Care of Carpinteria program. For more information about Hospice of Santa Barbara, including volunteer opportunities, call 805–563-8820 or visit www.hospiceofsantabarbara.org.